antique sewing machine - Whight & Mann Alberta 1. Whight & Mann first offered the "Alberta" during the 1860s. 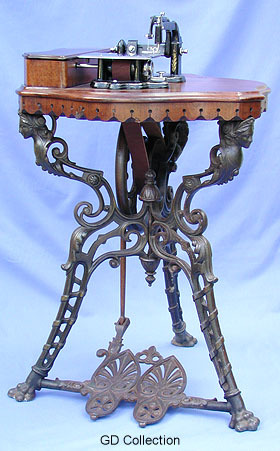 Today, this very rare treadle can be considered one of the most desirable English combinations. A foldback full cover version was also marketed. To make provision for this, the machine head and accessory box were repositioned on the table. Consequentially the flywheel was fitted on the opposite side of the back leg, and the footplate was recast to allow for the realigned pitman connection - see here.